"After one taste of French food ... I was hooked. I'd never eaten like that before, I didn't know such food existed. The wonderful attention paid to each detail of the meal was incredible to me. I'd never really drunk good wine before, and knew nothing at all about it. It was simply a whole new life experience." My knowledge of french food is limited, I honestly would not be able to diffrentiate between the good and the great of french food ; But I am not a food critique, I am a food enthusiast. 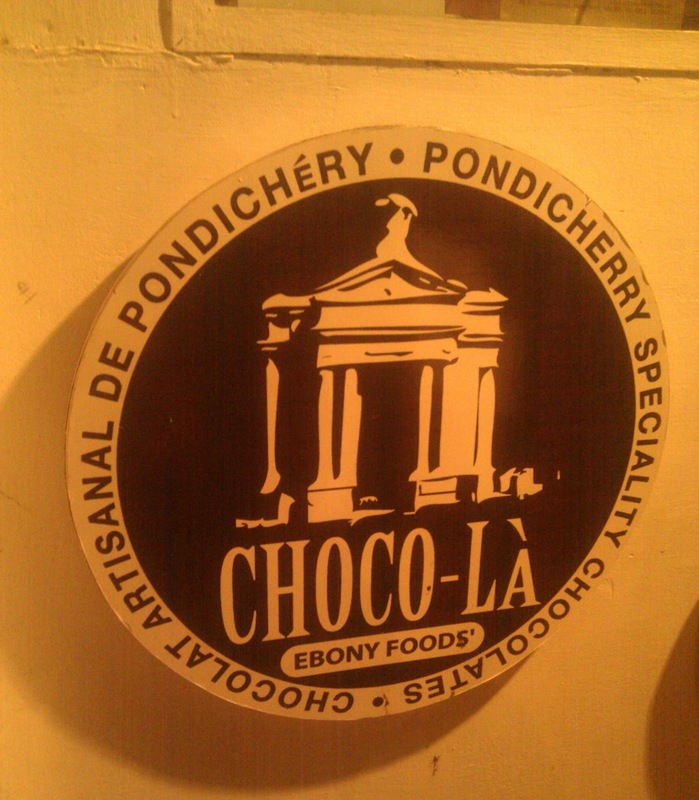 On this enthusiastic note, we took on a foodie trail through the erstwhile french colony- pondicherry. What and where do you eat when you have 24 hours in pondicherry?! A mouthwatering challenge, which two food enthusiasts cheerfully accepted. We arrived at the seaside union territory during the wee hours of the morning, early enough to catch the sunrise over the sea, and cups of coffee at the famous le cafe on the promenade. The le cafe boasted of a variety of croissants and other french food. The coffees were not awe inspiring, but they fulfilled the adage that eating is not just about the food. 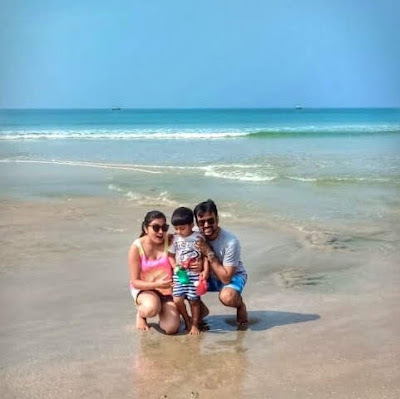 The calm sea, the lilting breeze, a fisherman's boat out at sea, a few bouganvillias lining a quaint cafe added to the charm, and was the perfect entre for an indulgent day at pondicherry. 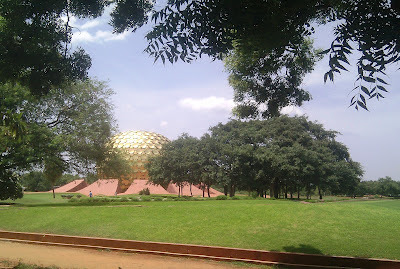 We moved in search of greener pastures, and found ourselves at the auroville. An international community which believes in The Mothers dream of a place of unified beliefs and religions, where people lived in harmony. The Auroville cafe much like auroville itself is about clean, unpretentious food hailing from different parts of the world. A self help cafe which offers its patrons everything from Idlis to pizzas. It was 8 in the morning by that time and we were craving a chocolate fix. A Marble cake and a chocolate pudding cake was promptly consumed. The cakes were a bit dry and needed to be washed down by a refreshing masala tea, and a cleansing glass of lime juice. Again I felt that the surroundings added to the food- The different patrons of auroville hailing from so many countries, the interesting architecture of the building incidentally by a french architect, and the over all sense of well being emanating from the place had a lot to do with our enjoying our food. Indulgence was the definite mood of the day, and after a much gratifying shopping spree, and a soul cleansing session of meditation at the matri mandir, we set out in search for our french cuisine quest. Our quest ended at Satsang- the french and italian eatery. Now satsang is a hindi name for a gathering of god men and preachers, a satsang is what one would expect by the side of river ganges in Varanasi, and not a place of french cuisine. The rikshaw driver who was acting as our food guide was pretty pleased with his choice and inspite of his forehead being smeared with ash proclaiming him to be a devout , we ventured into the satsang. Pleasantly surprised by the indo-french fusion decor of yellow walls with pictures of God men no less, and black wrought iron chairs reminiscent of french cafes. The menu was also printed in french no less, with english translations, giving the whole eating experience an exciting voyage into the unknown feel. An interesting contrast was the prawns in honey and ginger, which had me licking my fingers. What was definitely the high point of the menu was finding my favourite animated movie namesake RATATOUILLE on the menu. I squeeled in joy at the mere thought of finally getting to taste this enigma. It was similar to the time I was obssessed with wanting to try lasagna simply because garfield loved it. The Ratatoulle was delicious to look at, but it had brinjals and pumpkins in it, which are not my favourite of vegetables. But the whole joy of being a food enthusiast is getting to taste different types of food, and I am always game to try everything atleast once. Just when we had finished ordering (over ordering) our lunch, I saw Beef Bouillon on the menu! My only tryst with beef bouillon Bœuf bourguignon is through the movie Julie and julia, about the famous french cook book writer Julia child. another movie I have watched many times and remember the heart warming scene where Julie is preparing the beef bouillon from Julia childs cook book. I vowed to try that the next time I was in pondicherry. I also realised the huge impact that popular media has on our perception of food. French food especially is exalted as one of the finest in the world and for a food enthusiast like me, movies like 'ratatouille, and julie and julia' have made me love the cuisine even before I have tasted them. A sense of grandeur, a sense of mystery and a sense of timelessness, that is the very essence of french cuisine. Sumptuous lunches deserve to be applauded with a great dessert and we found ourselves an interesting cafe to indulge our taste buds once more. The baker's street offered a range of sandwiches and french breads (baguettes), but we could only accomadate a delicious fruit tart (tartes aux fruits) and dark chocolate rochers. 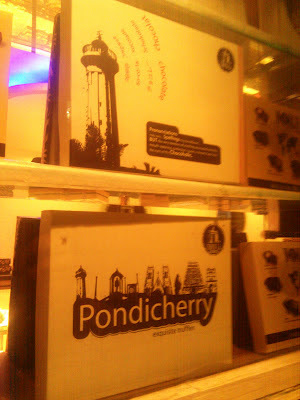 We were seriously contemplating walking the length and breadth of pondicherry to allow us an appetite for dinner by now. By dinner we were raring to try more of what pondicherry had to offer and were much pleased to find ourselves at the doors of rendezvoux, a restaurant recommended by many tourists as well as locals of pondicherry. Since morning we had been to places which boasted of a great location, ambience , decor and concept, but rendezvoux was different. A non assuming place decorated with reprints of a few watercolour paintings, and a board telling about the days specials. The food on the other hand was the true winner of the day. The prawn cocktail was not garnished by the tails of shrimp like many places, but had the sweetest and most tender prawns in a wonderful mayonaisse. 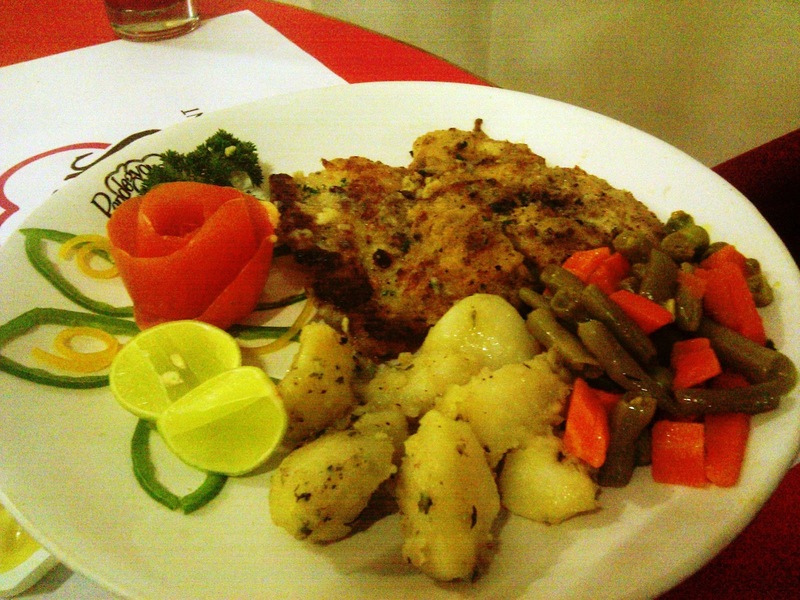 The sea bass steak was glistening with butter, golden crust and melt in your mouth fish. The grilled chicken was succulent and served with a generous helping of french fries. We could not have asked for more. well actually we could ask for one more thing.... more desserts. our last stop for the day was choco-la. A chocolate haven for foodies. Pondicherry has much to offer in terms of a relaxed sea side holiday, a soul searching time at matri mandir and aurobindo ashram, the french architecture of bygone days, some awesome haute couture in the upmarket shops, and the eclectic variety of food. After a single day of sensual overload of great sights, smells, tastes we were ready to head back home with a head full of memories, a mouth full of chocolate, a tummy full of indulgence and a heart full of gratitude and apprecition. Here is to the good times- bon Appetit.